I was not hungry for another one of these movies, but it turns out “The Hunger Games: Mockingjay-Part 1” was really just an appetizer. With a title this long you would think it would be more filling. In the last movie, Katniss Everdeen (Jennifer Lawrence from “Silver Linings Playbook”) was saved by the rebel resistance, but the Capital folks grabbed her buddy Peeta Mellark (Josh Hutcherson from “The Kids are Alright”). The resistance is led by President Coin (Julianne Moore from “Don Jon”), who needs Katniss to be the face of the revolution. It’s a shame all Katniss wants it to do is save Peeta. 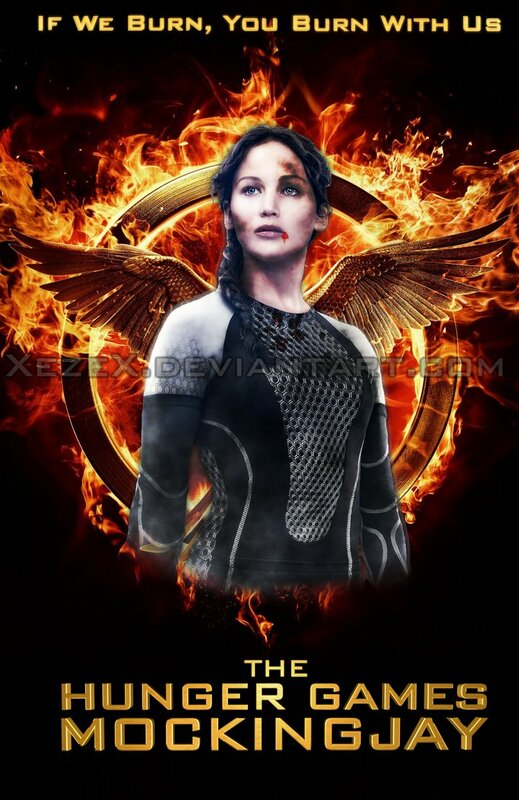 So, the first third of the movie is spent convincing Katniss to believe in herself and something more than herself. The second third of the movie is spent watching her make a movie trailer to get the other districts to buy into the rebellion against the Capital. She doesn’t want to be the poster child for this war but she plays the part President Snow (Donald Sutherland from “The Mechanic”) has cast her in. I have not read the books, but I have seen the movies, and I am in the group that thinks there was no reason to turn the Mockingjay thing into two movies. However, this is what studios do these days, ring as much box office as they can from the characters and the sets and pad the scenes for more screen time. Not much different than the indie movies I worked on where they show people driving places, getting out of the car and walking up to a house. Just add some dramatic music and a long crane shot and take your sweet time getting to the next plot point. While I was annoyed at the slow pace and lack of progress in the story, it was nice to see the old gang. Watching Phillip Seymour Hoffman’s mastery as Plutarch Heavensbee brought even more weight to the role. Perhaps I need to be more accepting of the episodic nature of the story as they did try to have some character development moments in this edition. I should be even more intrigued about the last movie and excited to see how it all winds up. Stay tuned for that review, but for bits of character work spread out in the two hour of this movie I will give it 3 stars out of 5. Finally, now I can say let the games come to an end. 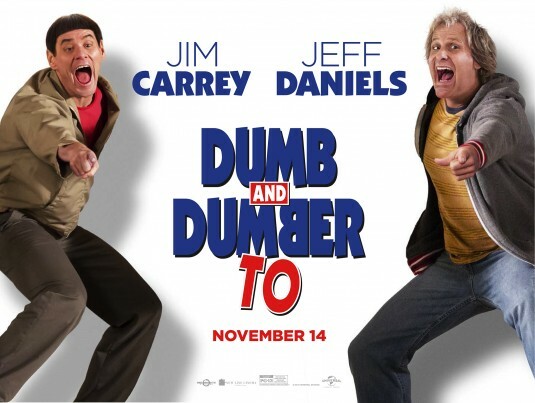 As Obi-Wan once asked, “Who’s the more foolish, the fool or the fool who follows him?” After seeing “Dumb and Dumber To,” I think I understand. Lloyd (Jim Carey from “The Incredible Burt Wonderstone“) has been catatonic in a psych ward for almost two decades. Every week, his friend Harry (Jeff Daniels from “Looper“) comes to see him. When Harry tells him he is dying and needs a kidney, Lloyd finally comes clean and admits he has been faking for 20 years. Harry visits his parents’ house to get a kidney and finds out he is adopted and his biological parents are dead. They give him a box of his old mail, including a 22-year-old letter from an old girlfriend letting him know she is pregnant. Soon our two simpletons are off on a road trip to find the kidney, I mean the kid with the kidney that can save Harry’s life. The first stop is the old girlfriend, Fraida Felcher (Kathleen Turner from “The Perfect Family“), who tells them she gave the baby up for adoption. At least she had an address for the child from a letter returned with the note “do not contact me again.” This does not stop the dynamic duo. About this time, like 40 minutes in, I realized this was supposed to be a comedy. The juxtaposition of the moronic behavior of Harry and Lloyd against the rest of the plotting of soap opera cliché characters was supposed to have me rolling in the aisles. Instead, I was barely rolling my eyes at the staccato string of silly site gags and one-liners. Most of the time it was setup followed by the punch line, and then Harry and Lloyd would laugh as I listened to hear if anyone else in the theater thought it was funny. All I heard from the 1/3-full audience over the entire movie was a single “Ha.” I know I may be “too old for this,” but so are these leads. I love a good zany comedy, but all the talent in this movie, both behind and in front of the camera, was wasted. We all know the bit, and we are okay with that, so please put some meringue on this pie before you smash it in my face for the hundredth time. There was the standard, heartwarming Farrelly Brothers ending, and that was just enough for me to give this movie 1 star out of 5. I should have listened to Obi-Wan; the farce was not with them. 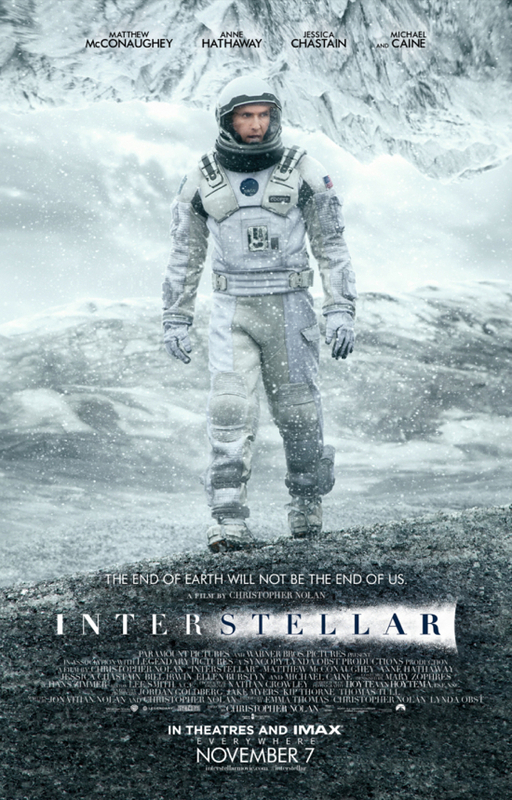 I thought “Interstellar” was going to show me how to get from one stellar to another. Now if I could only get back home, I am sure I could save the humanity. In the very near future, the world is drying up and blowing away. It turns out we can’t eat our technology and we run out of food before we run out of bandwidth. This kind of climate calamity turns former astronaut Cooper (Mathew McConaughey from “Dallas Buyers Club”) into a gentleman farmer. He raises corn and what is left of his family after his wife dies. When a strange communication leads Cooper out to a hidden NASA base, his old boss Dr. Brand (Michael Caine from “Now You See Me”) enlists his help to save everyone on the planet. All Cooper needs to do is pilot a ship through a wormhole that just showed up next to Saturn and link up with some other folks Dr. Brand sent through the wormhole 10 years ago. He gets to take Brand’s daughter, Amelia (Anne Hathaway from “Les Miserables”), along with a couple of other guys you just know are not going to make it. This is your classic doomsday sci-fi movie with a farm boy, a hot girl and a wormhole affecting the space-time continuum. I won’t tell you about the black hole or the twist where it turns into one of the “Bourne” movies. The whole thing feels very “Star Trek” in a good way, with enough of a family story for you to care about these people. McConaughey is good, but you never forget you are watching a movie with a movie star. At least when you are watching Tom Cruise you know he is an alien. Where “Gravity” was riveting, this movie was entertaining. Where “Guardians” was a romp, this movie was environmentally conscious. Director/writer Christopher Nolan (“Inception”) set out to make an epic, but he will have to be satisfied with a pretty good movie. His theory of relativity is all about the relatives, and the promise a father makes to his daughter. Having two daughters myself, I liked that, and therefore I must give this movie 4 stars out of 5. Outer space can still be pretty stellar. 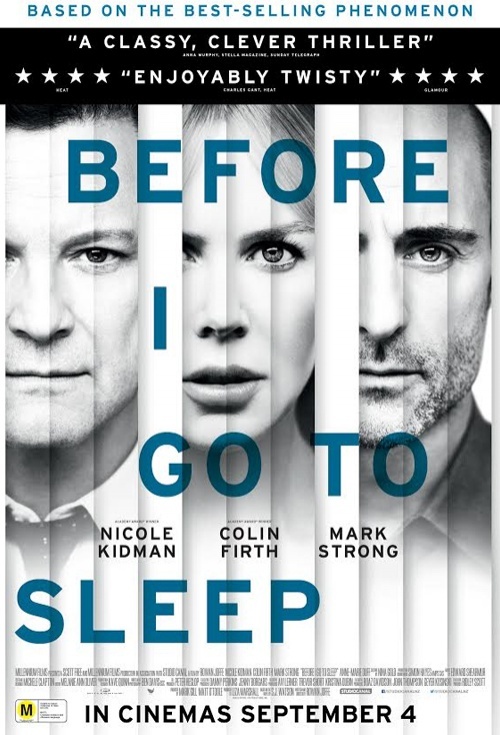 Even though she got the restraining order, I was able to see the new Nicole Kidman movie “Before I Go to Sleep” today. Now I don’t know if I will be able to sleep tonight. Christine’s husband, Ben (Colin Firth from “Magic in the Moonlight“), has all kinds of notes and pictures around the house to let her know what is going on. Most days she just wanders around the house looking for her 26-year-old face in the mirror and all she can find is her 40-year-old mug. One day, right after Ben leaves for work, the phone rings. It’s Dr. Nasch (Mark Strong from “Anna”), who tells her to get the camera hidden in her bottom drawer. There she finds a video journal she has kept for two weeks explaining the bits and pieces of her life she has put together. The doctor has been treating her and doing a little detective work as well. Soon she does not know who she can trust – including the doctor. She starts to think Ben must be some kind of a saint, or perhaps there is something else going on. You start to think Ben should leave her since she would not remember him the next day anyway. Director/Writer Rowan Joffe (“Brighton Rock”) does a fine job with the S. J. Watson novel, and we soon forget about the charming silliness of the Sandler movie. We are left with a fair little mystery like we used to see on “Alfred Hitchcock Presents.” I would have liked to see more actual drama and less melodrama, but I am used to wanting more. It was nice to see Colin Firth not be so nice so my wife can see his true nature. For that I must give this movie 3 stars out of 5. If you wake up next to Nicole Kidman just tell her you are Adam Sandler and fix her an omelet for breakfast.